After debuting on Digital HD last month, Hot Tub Time Machine 2 arrives on Blu-ray and DVD today from Paramount Home Media Distribution. 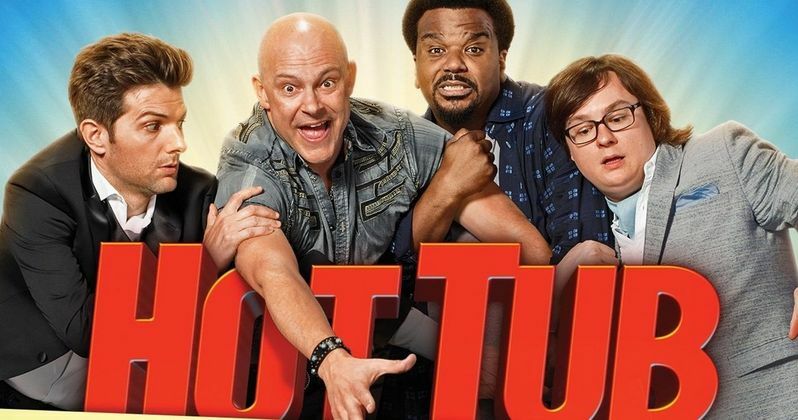 Rob Corddry, Craig Robinson and Clark Duke reprise their roles from the original Hot Tub Time Machine, with Adam Scott joining the cast as the future son of John Cusack's Adam. To help celebrate the Blu-ray and DVD release, we have a new giveaway lined up where fans can win tons of prizes. Nick (Craig Robinson), Jacob (Clark Duke) and Lou (Rob Corddry) have all changed their lives thanks to the power of the hot tub time machine. Everything is going well until tragedy befalls Lou, who is now the inventor of the Internet. During a big party, someone shoots Lou. In order to save his life, his friends must use the hot tub time machine to stop the attacker. But instead of going into the past, the three end up ten years in the future. Not only must they cope with a strange new world, they must also find out who was behind Lou's shooting. Gillian Jacobs, Thomas Lennon, Chevy Chase, Collette Wolfe and Kumail Nanjiani round out the supporting cast of this comedy, directed by Steve Pink. Fans can win a Hot Tub Time Machine 2 Pool Party Kit, which includes a poster signed by the cast and filmmakers, the Blu-ray Combo Pack, a dickPAD, pool beer pong, pink flamingo beverage floaties and a "mysterious floating object" for the pool. Take a look at how you can win these prizes below. - Hot Tub Time Machine 2 "mysterious floating object"
· The Future as Seen from the Tub! · You're in the Hot Tub Now!